The Lowfield Heath windmill first appeared on Rocque’s map of Surrey published in 1762, when a James Constable owned it. The Constable family was recorded as running a mill on Horsham Common in 1615 and mention is made of a mill being brought from there to Lowfield Heath as early as 1738. Although the mill finished work by wind sometime in the early 1880’s, Grinding continued at least until 1890, probably by the use of a set of steam driven stones in the roundhouse. A receipt dated 20th November 1890 survives from this period. By 1934 dilapidation had crept in and by 1957 the weakened structure was wrecked in a storm.In January 1964 emergency work emergency work was carried out which included the fitting of a temporary roof & metal straps to the trestle. Between 1965 & 1971 further work was done including a new roof; rear framing; rear steps and also work on the roundhouse. The adjacent property was demolished in the early 1980’s by which time the mill was becoming derelict once more. 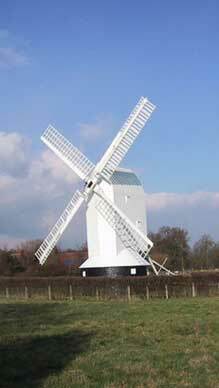 In 1986 the Lowfield Heath Windmill Trust was formed whose stated aim was to restore the mill to working order. 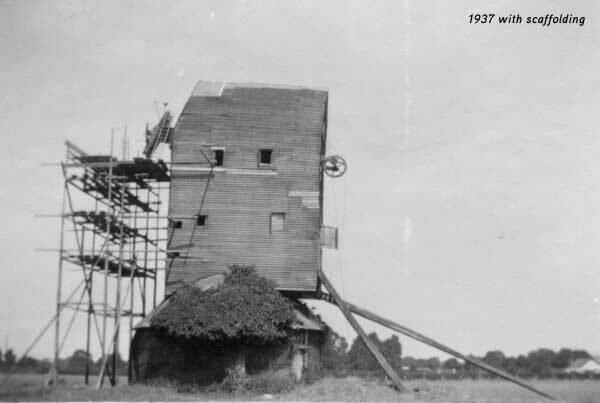 Access difficulties & concerns over the deterioration of the structure lead to the decision to move the mill to a new site was adjacent to Gatwick Zoo by kind permission of the owner Terry Thorpe. Thus with funding in place and the employ of millwright Peter Darby, dismantling began in June 1987 and by September 1987 the mill was gone! Following restoration of the timbers and the bricks, the rebuild proper took place over the summer of 1989, commencing in May with the lowering of the crowntree onto the post. Each section was erected in the reverse order of removal and by June the side frames were in place. The front and rear frames followed, together with the windshaft and its fine tail wheel casting. All was completed in time for HRH Princess Alexandra to open the mill on April 10th 1990. This marked the end of the first phase of restoration - the completion of the main structure. The following years saw sterling effort by the volunteers. Timbers for a new roundhouse roof were machined, and construction took place in November 1991 followed by doors and windows. Local oak was seasoned and fashioned into floor joists and floorboards for the roundhouse, spout and stone floors. A new rear ladder was made and many other smaller jobs too numerous to mention were completed. .Finally the roundhouse was fitted out with display boards and an audio visual system. On the 26th June 1998 cloth was spread on the sails, the shutters closed and at 3.30pm the mill ran for the first time since 1880. In 2003 following storm damage, new Common sails were fitted together with a replacement tail pole and the mill repainted. This year also saw the start of the last major part of the restoration – the Bolter. This is a machine to grade the flour and is being copied from a similar one in Keston Mill near Bromley. In September 2004 and after many years of trying, the trust finally managed to secure the rescue of the remains of the machinery from Jolesfield windmill and have set-up a display within the mill grounds. May to August, last Sunday in each month, 14.00-17.00. Peter James, tel. 01403 272664.